The Network Arborist: In service software upgrade ISSU on a Juniper leaf switch QFX5100 with minimal traffic distruption. In service software upgrade ISSU on a Juniper leaf switch QFX5100 with minimal traffic distruption. The Juniper QFX5100 switch has the ability to be upgraded while in service (production) with minimal impact. This is useful when let's say this QFX is used as a leaf switch with servers directly attached to it. Since most TOR (Top-of-Rack) switches do not have redundant CPUs, i.e. control plane, this feature is a necessity. Currently Data Centers would have to migrate VMs on host servers to other hosts residing on other TOR switches. An upgrade would happen on the switch that would be taken out of service and then VMs would have to be migrated back. This could take several hours and also could be an issue if resources on other switches were limited. Just like Virtualization in the Server world, the QFX switch has a hypervisor (KVM) and a VM that runs JUNOS (JVM). You would need to configure GRES (Graceful Routing-Engine Switchover), non-stop routing and non-stop bridging before starting. 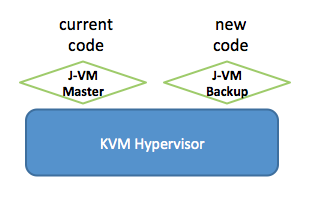 Using the new code image a second JVM is launched as a backup. Next a Master-Backup election would happen between the VMs with the Master being elected on the current version of code. It will then sync all the state tables to between the two VMs. The Backup VM would then connect to the Packet Forwarding Engine (i.e. asic). Kill the old JVM running the old version of code. In this test I setup IXIA traffic testers that injected 10K OSPF, 2K BGP routes and 10K mac addresses. Traffic was then sent to these destination addresses. That's 52 frames lost with a service disruption of 2.6 ms (milliseconds).